As a wedding celebrant, I am very aware of all the different elements that blend together to make your wedding day perfect. Music plays an important part in capturing who you are as a couple, whilst also shaping, and giving cohesion to, the different parts of your wedding day. The music was a really important part of the whole wedding weekend for Chris and Sophie. They knew that everyone had good food, plenty to drink and great music; their guests would have an amazing time. An old school friend of Sophie’s, Harry Harding, hosts Open Mic Nights, that Sophie, Chris and many of their friends often go to. 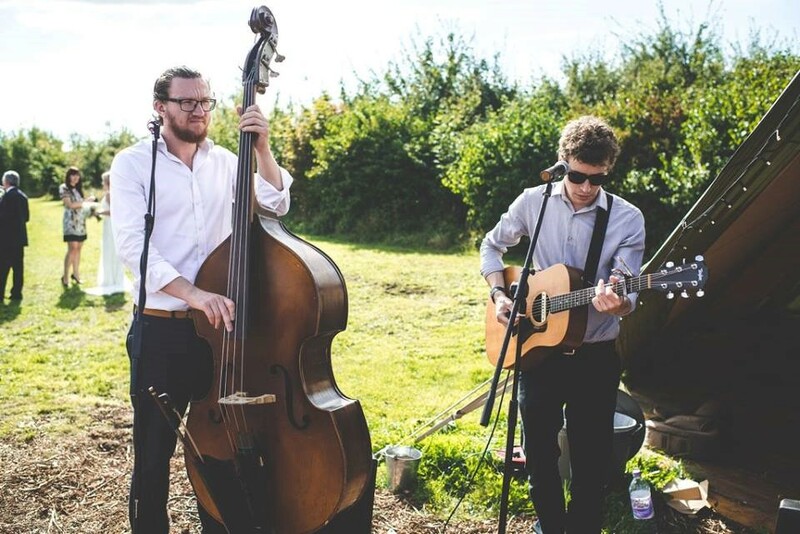 They knew they wanted him, and his friend Chris Jones on the double bass, to play and sing at the wedding and were thrilled when they said yes. 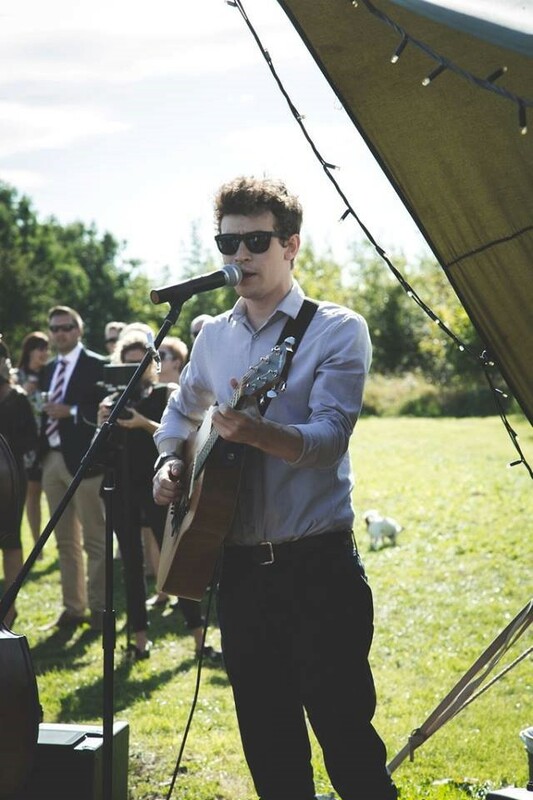 The guests were greeted with their music as they strolled from the hay bales in the ceremony field, to the tipis for a welcoming glass of Fizz, canapés and photo calls. Everyone was mingling in the sunshine, enjoying canapés and fizz, photo calls and catching up with family and friends. 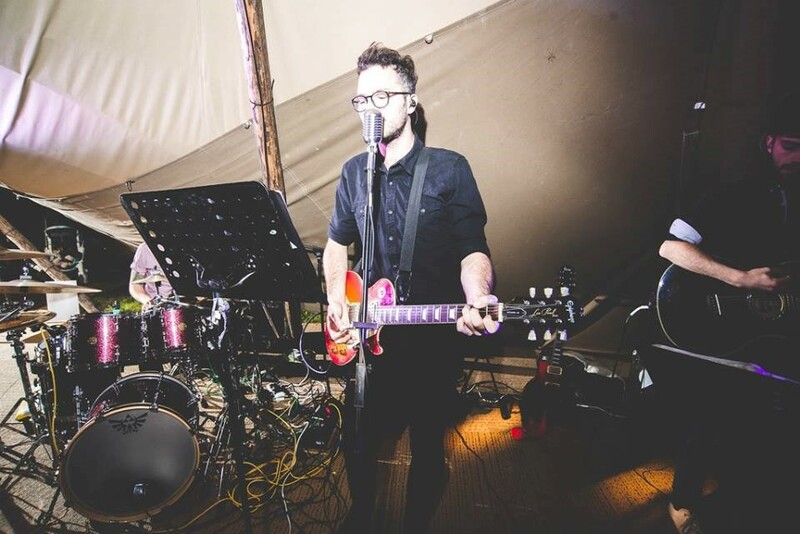 Chris and Sophie knew they wanted a live band, for the evening, but musicians that could offer something a bit different in their repertoire, without having to resort to some of the old 70s and 80s sing – alongs. I think that they dreaded their prospective father-in-laws strutting their stuff John Travolta style to “Staying’ Alive“! One of their perquisites was that the band were capable of playing Wheatus’ “Teenage Dirtbag“, as for both Sophie and Chris this song is the ultimate classic from their teenage years. (Please don’t see this as a reflection of their upbringing). They researched lots of different genres and bands online and found that they both really liked Mumford- style music, with double bass and banjo etc. The Band Boutique thebandboutique.co.uk works with the style of bands they like. Through them found the Baker Boys. Not only did they do a Mumford style set, but they also did an hour of Indie Music – just what Sophie and Chris wanted. They certainly got everyone up and dancing. Chris and Sophie chose “Sweet Disposition” from The Temper Trap as their first dance, and the band played it for them, which was perfect. The song captures their love for each other and who they are as a couple. A lot of careful thought goes into your choice of song for your first dance as husband and wife for every time you hear it play you will be magically transported back to those special moments on your wedding day. A good friend of Sophie and Chris’ Adam Hignell AKA Rab C, offered to DJ for them after the band had finished and created a set of their favourite songs. The music, dancing and partying flowed seamlessly through the day, into the evening and long into the night. I’m going to mention two very talented people, Nina Constable, ninaconstable.co.uk and Lionel JoJo Taplin stealthedayphotography.co.uk who unobtrusively worked around everything that was happening to capture the day for us with lasting memories. A beautiful film of Chris and Sophie’s wedding was created by Nina Constable, whilst all pictures in this series have been are reproduced with kind permission from Lionel JoJo Taplin. I hope you have enjoyed this series, which has looked at the different elements of a wedding, from the venue, food and flowers, music, and bridal wear, to photography and how they all blend together to create a unique and memorable occasion. However, whilst it can be easy to focus on these elements, we mustn’t forget the most important purpose of your day. 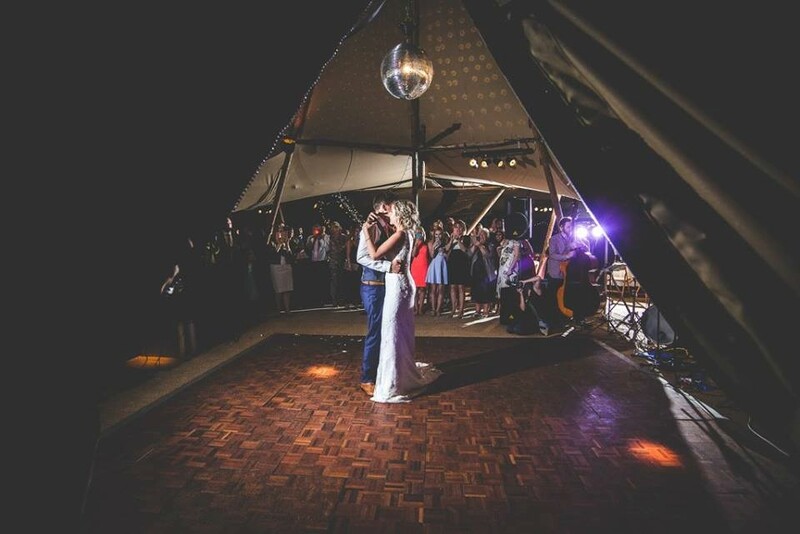 I believe the ceremony lies at the heart of your wedding celebrations. It is the chance to look into your partner’s eyes, and make a promise, with friends and family witnessing, to commit to each other for life. As a celebrant, I will perform your ceremony in the venue of your choice. You may have a place that is special to you, or need help in deciding and choosing. Whilst my focus will be on creating the perfect ceremony for the bridal couple and their guests, I am more than happy to offer my experience, advice and guidance across all the different elements, of your special day. 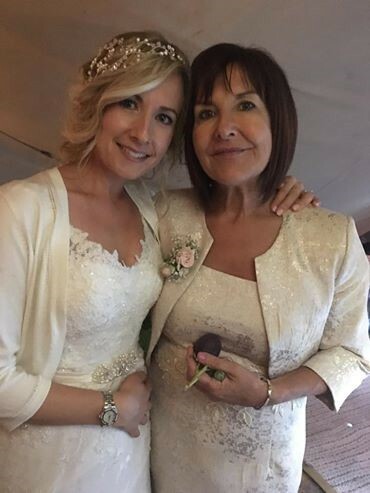 Well, that all from this series “Mother of the Bride – A Wedding Celebrant’s Perspective”. In my next series, I’m going to give you some ideas and inspiration for your wedding ceremony by showing you a range of different elements. These can be woven into your special day to make it unique to you and your H2B. (Initially I thought H2H was a pencil – but it stands for husband to be)!! But, maybe, before that, I will show you another side of the work I do, funeral celebrancy – and how privileged I am to be able to work with families to created a personal, unique and memorable ceremony, one that celebrates a life well lived.